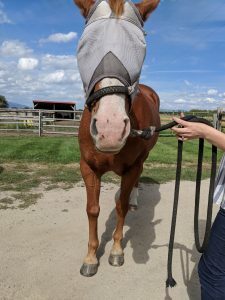 Abstract: Henry is an older QH gelding with chronic right carpal arthritis whose owner elected to treat with joint injections to maintain comfort. The patient was found to have significant back pain on exam as well. After a few acupuncture treatments, more time is needed to determine results in terms of improvement of lameness and pain secondary to arthritis. However, the perceived back pain significantly responded to dry needling and electroacupuncture. Henry is a 21 year old Quarter Horse gelding who is used mostly for trail riding. He is pastured the majority of the time and is ridden approximately 1-2 times per month. Aside from ongoing lameness issues, the patient is otherwise healthy. Henry’s lameness and notable pain were first recognized in August of 2017. According to the owner, carpal radiographs were performed by another veterinarian and Henry was diagnosed with right carpal arthritis. At that time, joint injections with steroids (80 mg of Depo Medrol) into the right intercarpal joint were initiated for comfort. The joint injections initially provided about six months of perceived relief. Recently, the injections are more frequent, about every 6-8 weeks due to pain. Henry gets oral phenylbutazone for a few days in a row when he is acting especially sore, about once per month. On physical exam, Henry has normal mentation, his vital signs are within normal limits, and his body condition score (BCS) is 6/9. Henry is notably lame on the right forelimb. At the walk, he has a decreased cranial phase of stride, brings the limb medially to weight bear, and avoids full carpal extension on the right forelimb. Henry has firm swelling along the right carpus medially (most significant distally at the carpometacarpal joint) and decreased range of motion. There is mild effusion of the left medial carpus as well. Henry has right fetlock valgus when standing, likely secondary to his carpal changes and compensation. On myofascial palpation, the patient has significant trigger points in the lateral cervical neck bilaterally, very near point LI 17. There is palpable heat and swelling in this region bilaterally. Henry is very painful on palpation of the mid-thoracic back near BL 17-19 bilaterally. No lumbosacral pain is noted but there is pain of the right sacroiliac joint. Henry has mild bilateral temporomandibular joint (TMJ) pain as well. He has good range of motion of the cervical spine. Henry has his teeth floated regularly (once yearly). His most recent blood work was performed over a year ago and was mostly unremarkable. The carpal radiographs were performed elsewhere and I have not had access to them. My suspect definitive diagnosis for Henry is right carpometacarpal joint arthritis. He has obvious firm swelling of the right medial and distal carpus and secondary lameness. He has a history of osteoarthritic changes to the carpus on radiographs and responds well to steroid injections of the intercarpal joint. The intercarpal joint typically communicates with the carpometacarpal joint which is where I suspect most of the arthritic changes are. I suspect that the cervical trigger points are related to the right forelimb pain and the associated gait change causing compensatory strain. Henry is very sensitive to paraspinal palpation near the T12-T15 spine which could be secondary to forelimb pain as well or primary back pathology. -Degenerative- Osteoarthritis, proximal suspensory desmitis, collateral ligament injury. -Infectious/inflammatory-Septic arthritis, bone cyst, carpal hygroma. -Congenital- Poor conformation leading to secondary osteoarthritis, osteochondrosis. -Myofascia- Myofascial restriction, likely a component of the back pain. Since Henry has multiple problem areas (right forelimb, mid-thoracic spine, lateral cervical), I tried to address all of them with a thorough integrative approach to acupuncture. We have had three sessions total so far. My initial acupuncture treatment was immediately after Henry received a joint injection by my colleague. This treatment included dry needling and electrical stimulation. The sequence of treatments was not ideal for this patient initially as we went four weeks in between the first two treatments due to scheduling conflicts. The second and third treatments were one week apart which I think is much more ideal for this patient, given his degree of inflammation. We are working on a schedule going forward, likely every two weeks due to owner availability. The first treatment was at the hospital but the following treatments were at the owner’s property where Henry lives. I felt that the treatments where Henry did not have to be trailered to the clinic much more rewarding. By going to the property, I have the opportunity to evaluate him in his usual environment prior to starting treatment and assess his comfort level. Using the technique we learned at the clinical intensive, I try to stimulate neuromodulation on Henry by affecting the nervous system centrally, peripherally, and through autonomic regulation. The main nerves that I am focused on stimulating are the radial, ulnar, and median nerves as these are the nerves affecting the carpal flexors and extensors. I also want to make sure that I address the myofascia as this is likely playing a large role in Henry’s overall comfort. Any additional trigger points that I find on myofascial exam are dry needled to decrease myofascial restriction. As previously mentioned, the last two treatments on this patient were only one week apart. If it was up to me, I would continue once weekly treatments on this patient for four weeks, then start to back time down but this is not possible for the client. At this time, it is likely that we will be going to every two week treatments which I still think will be valuable for the patient. On all acupuncture points on Henry, both dry needling and electrical stimulation, I use Sierin J type needles that are 0.25 mm in diameter and either 30 mm or 40 mm long. I have used the 40 mm length on inner BL line points as they easily get “sucked in” to the tissue after the needle grab. GB 21-On all of our acupuncture treatments, I have started with GB 21. This point is typically well tolerated and lets me evaluate how Henry is going to respond to the needles that day. This point is also good for local muscle tension and is not far from Henry’s lateral cervical trigger points. SI 11 and SI 12- These points are well tolerated by the patient and are used to support the suprascapular nerve. I am also interested in using this points as peripheral points to further stimulate the spinal segments that are the origin for the radial and ulnar nerves as these cannot be as easily stimulated in a horse as a dog due to overlying muscle. SI 9: This is a nicely palpated point on Henry that occasionally has a trigger point associated with it. I dry needle this point and use it with electrical stimulation to LI 11 to increase neuromodulatory stimulus to the radial nerve. LI 1: This point is not very well tolerated in Henry but I have tried to use it with 0.16 mm x 15 mm needles to affect the median and ulnar nerves which control the flexors of the carpus to increase mobility. LI 11: I use this point for radial nerve stimulation, for its anti-inflammatory properties, and as a local point close to the carpus. LI 16: I use this point to affect the cervicothoracic spinal nerves which have compensatory strain from Henry’s right forelimb lameness and change of gait. LI 17: This point is dry needled bilaterally to address myofascial restriction and release the trigger points palpated in this area. ST 36: I use this point as a peripheral nerve point and to upregulate the autonomic nervous system to decrease inflammation and pain. BL 10: I use this point to address cervical tension. BL 11: This point is used for central nerve root stimulation of T1-T2 to neuromodulate the ulnar nerve. BL 13: This point is used to address thoracic limb pain. BL 17, BL 18, BL 19: These points are approximately located where Henry has the most reaction to spinal palpation. I get a very strong reaction to gentle palpation of the longissimus muscle bilaterally in this region. I dry needle these points as well as run electrical stimulation across them to help address myofascial tension. Bai Hui: I use this point for autonomic stimulation to decrease inflammation and to address Henry’s back pain. I usually start on Henry’s right side so that I can ensure that I get that side done if he decides to limit my needle placement. I dry needle as many points as I can at a time (typically about 10 needles for this patient). Once the needles on that side have been in for about 5 minutes, I hook up electrical stimulation from SI 9 to LI 11. If pt is tolerating that well, I may try to hook up a second lead from BL 15 to BL 19 or from BL 19 to Bai Hui. I have an ITO ES-130 three lead electrical stimulation unit. I see a muscle twitch in Henry at an approximate frequency of 1.5-2.5 Hz. I leave the E-stim running for about five minutes if he will tolerate it. I then remove all my needles and start again on the opposite side. I chose this case because it is the only large animal case that I have done several treatments on at this point. However, I do not feel that I have seen a large quantifiable result yet in terms of Henry’s lameness or inflammation. I have noticed that with my small animal patients with osteoarthritis pain, it takes about 4-5 acupuncture treatments before I really see results. I believe that this will probably be the case with Henry as well, although my results will be murky due to Henry receiving another joint injection this week. 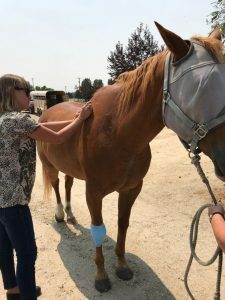 Since the owner is electing to have the patient receive joint injections and acupuncture, I am not able to say for sure the acupuncture is helping the lameness or not. In the future, I will measure success based on length of time between joint injections. On the contrary to Henry’s right forelimb pain, I do feel that I have noticed a large difference in his back pain since performing the acupuncture. I palpate his spinal musculature prior to each treatment and the response to the same gently pressure is far less dramatic than it was initially. I believe this is due to neuromodulation and release of myofascial tension due to the acupuncture treatments as the patient has not received any systemic anti-inflammatories recently. This is an important case for me because I am likely to see many more down the road that are very similar. I live in a rural area, most horses are used for trail riding or farm/ranch work. These older horses in my area suffering from arthritis are not likely to have advanced imaging performed and are very unlikely to have any surgical arthrodesis, etc. There are definite issues with placing horses on non-steroidal anti-inflammatories (NSAIDs) long term, such as GI ulcers and nephrotoxicity. Joint injections are a typically route for pain control but do not come without their own list of side effects. Joint injections with Depo Medrol have been shown to deleteriously affect the health of the articular cartilage in the long run . If acupuncture can be used to help prolong the length of time between joint injections or entirely on its own as a treatment modality, that will ultimately decrease the side effects that come along with conventional osteoarthritis treatment in horses. Most horses that are under any amount of work will have some sort of back pain. This patient’s quick response to electrostimulation over painful back muscles is promising and the same result has been found in other studies . Overall, I think I need more time and treatments with Henry to help minimize his discomfort from osteoarthritis and associated compensatory pain.